HD720P Portable DVR Car Camera is another "eye" in you car. It can capture high definition(1280 x 720P) pictures and display it on its 2.5 inch TFT LCD Screen. At the same time, this DVR007 car camera will record automatically and save the video files in the SD/MMC memory card(memory card no included in the package). Files can be save per 2 minutes/ 10 minutes/ 15minutes - without recyle recording. 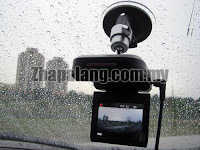 With the camera holde/ mount, you can fix it on the car dashboard or car windshield very easily.